1 of 3 Cook bacon in a large skillet about 6 minutes, until crispy. Drain on paper towels; crumble when cool. 2 of 3 Place half of the lettuce in a 14- to 16-cup salad or trifle bowl. 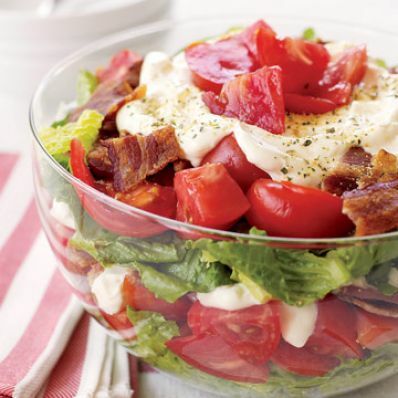 Sprinkle half of the tomato pieces and half of the crumbled bacon over the lettuce. Press to compress ingredients. 3 of 3 Spread half of the salad dressing over the top. Sprinkle with half the seasoning mix. Repeat layering with remaining lettuce, tomato (reserving some for garnish), bacon and dressing. Sprinkle top with remaining seasoning and reserved tomato. Cover and refrigerate for at least 2 hours.